How can women benefit from practicing Muay Thai program? If you are like most modern women, then you are probably concerned about your appearance. Of course, we are not talking only about the visual appearance because it is much more important how you look inside or whether you are healthy or not. The growing number of women suffering from obesity has triggered an alarm in women who have few extra pounds. They want to avoid the situation in which they will have to take drastic measures to lose their weight. The most obvious way to avoid this is to eat healthy and be involved in physical activity. One of the simplest ways to get these things is to travel to Thailand on your next holiday. Before we start talking about physical activity and healthy food, we should say that Thailand is the most popular holiday destination in Asia. Millions of men and women visit this country each year and almost all of them say that they will gladly come back. The reasons why we are suggesting Thailand to women who want to improve their physique and mental health is Muay Thai. Thai boxing or Muay Thai is the national sport of Thailand, practiced by thousands of people there. Most of them are taking training classes because they simply want to get or stay in shape. 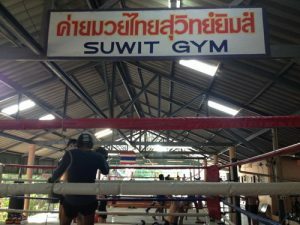 It is good to know that it is quite common to find female students in Muay Thai camps so you won’t feel or look awkward while you are training. A good Muay Thai training camp will have clean and adequate equipment for the training process. They will also have experienced trainers that can work with women, men, older and younger people without or with some experience in the field of martial arts and combat sports. Muay Thai classes are very intense and they can help you lose hundreds of calories in one hour. They also burn fat and speed up the metabolism which is definitely good for your loss weight plan. In addition, this fitness activity makes you stronger and teaches you how to defend yourself from unprovoked attacks.